Check out these tips for coping with stress as a truck driver. 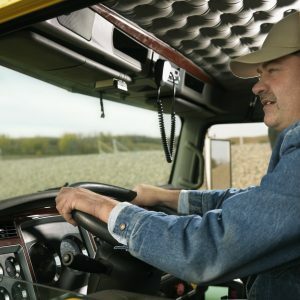 Many people struggle with stress or anxiety in their daily lives, but truck drivers tend to have higher stress levels than those in other job industries. The high-pressure career of trucking comes in multiple hours behind the wheel, which can be stressful enough, but is also combined with pressure to meet delivery schedules and deadlines. If you struggle with stress as a truck driver, continue reading to learn some helpful tips for coping and managing your stress levels. Chronic stress can take a mental and physical toll, and can cause serious problems such as depression, difficulty sleeping, heart disease, high blood pressure, obesity, and more. Many people turn towards comfort foods when feeling stressed, which often includes fast foods and generally unhealthy choices. When feeling stressed, it’s important to try to keep to a healthy diet of fruits and vegetables, as well as protein, healthy fats, and fiber. Eating healthy and cutting out fast food and soda will not only help your body feel great, but are important for keeping your mind focused on the road. Sleep has a huge effect on our stress levels, and getting quality sleep each night is crucial for your overall well-being. Having quality sleep of at least six to eight hours is essential for living a healthy life, as sleep affects your weight, focus, productivity, immune system, and mood. If your stress is making it hard to sleep at night, there are many tips and tricks to try to get your mind to relax at night. One important time is to leave enough time to unplug from electronics about an hour before bed to decrease stimulation. During this time, practice yoga or gentle stretches, and read a book before bed rather than watching TV. Also, take short relaxation breaks throughout the day to decompress and manage your stress. In addition to living a healthy lifestyle, there are many tools you can bring on the road to cope with stress in a healthy way. For example, stress balls are easy to use while sitting in traffic or on a short break, as drivers are using their hands and arms for many hours a day. Stress often takes a physical toll on our bodies, and using a stress ball to strengthen arm muscles or a massage roller to get out knots in your shoulders or back is one way to feel your anxieties melt away. This entry was posted on Thursday, July 19th, 2018 at 8:19 pm	and is filed under Trucking Industry. You can follow any responses to this entry through the RSS 2.0 feed. Both comments and pings are currently closed.